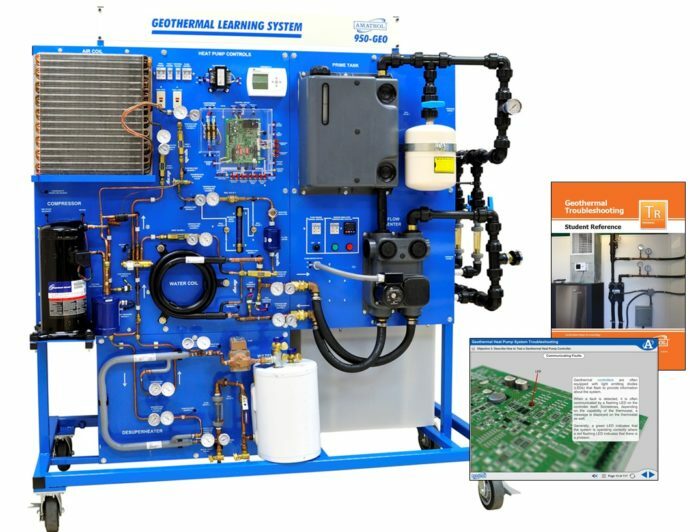 Amatrol’s 950-GEO2 Geothermal Troubleshooting Learning System is equipped with FaultPro, Amatrol’s premier electronic fault insertion program for teaching troubleshooting skills. Using FaultPro, learners troubleshoot electrical, mechanical, and fluid-based faults to become effective real-world experts on residential and commercial geothermal systems. In addition to troubleshooting, the interactive multimedia curriculum and hands-on skills will teach startup, operation, shutdown, and maintenance of a geothermal system. The 950-GEO2 uses an exposed component layout so that learners can see each component’s role in a geothermal system. Learners can easily observe, monitor, and test each component mounted and labeled on a vertical panel. Sight glasses installed in the 950-GEO2 allow the learner to see the refrigerant’s changing state as it passes through the system. Amatrol also includes pressure and temperature gauges at key points to show the system’s performance at a glance. Additionally, the system includes a custom designed, temperature-controlled ground simulator so the system can run continuously. Fault Pro: Electronic Fault Insertion Software! Using our world-class troubleshooting program, FaultPro, Amatrol has inserted over 25 electronic faults on the 950-GEO2! Covering electrical, mechanical, and fluid-based faults, Amatrol designed the 950-GEO2’s troubleshooting to allow learners to practice applicable industry skills and prepare them for real-world geothermal system problems. Amatrol’s troubleshooting systems are unmatched in their ability to simulate real-world equipment failures! From its 2-stage compressor and 2-ton heat pump to the ground source loop that includes a flow center and a header loop, Amatrol’s 950-GEO1 delivers features commonly found in installed geothermal systems but often excluded from training systems. These include a variable speed ECM air blower, water coil heat exchanger, sight-glasses at many points in the system for observing the refrigerant cycle, ample temperature and pressure monitoring, electrical test points, ground simulation, and even the high-density polyethylene pipe specified for use in installed geothermal systems. These components are clearly labeled and mounted for easy observation on a vertical panel, allowing learners to easily observe and evaluate system operation and performance. Ground Simulator Allows Continuous Training! Amatrol’s 950-GEO2’s ground simulator is a temperature-controlled system that creates a constant temperature to act as a realistic heat source/sink. A digital, programmable temperature control unit is used to set and maintain the ground simulator to the desired temperature, resulting in both accurate data collection and continuous operation. The 950-GEO2’s multimedia curriculum is highly interactive and features audio, text, and 3D graphics. The depth and breadth of knowledge offered, especially in the troubleshooting area, is simply unmatched in the industry. The 950-GEO2’s curriculum is so thoughtfully and carefully put together that it can be used in a traditional classroom setting or by learners following along at a self-pace. Amatrol’s 950-GEO2 curriculum is a strong starting point toward obtaining International Ground Source Heat Pump Association (IGSHPA) certification. Foundational knowledge and skills provided by Amatrol, such as startup and checkout procedures, flushing, purging, and charging the system, will be familiar topics to learners earning their certificates. The 950-GEO2D adds the operation, startup, shutdown, troubleshooting, and maintenance of a desuperheater system used for a geothermal heat pump system. It also includes all the materials from the 950-GEO2 Geothermal Troubleshooting Learning System.